Christmas is just around the corner, for steelhead anglers there isn’t a better gift than a bright chrome steelhead dancing across the surface. Spectacular leaps and runs are always anticipated but not always realized. Most diehard steelheaders begin their hunt for that big trophy early in the season, usually as soon as the crowds have thinned from the fall salmon fishery. Some of the bigger Steelheads are caught during the first few weeks of the season but these fish don’t come easy. Traditional Steelhead strategies must be used. Traditional Strategies? What’s that you’re asking? 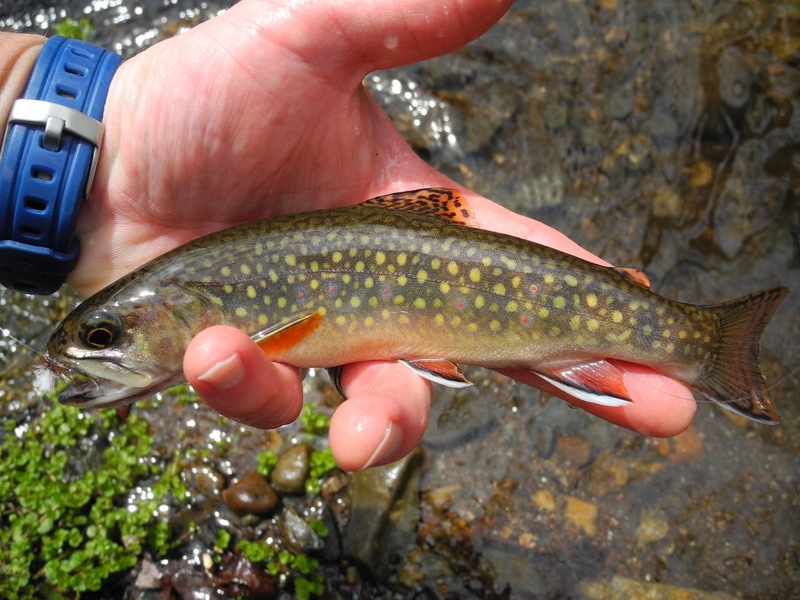 Angling methods revolve much as do lures, sometimes for the better sometimes not. Strategies used for catching salmon on our local rivers are much different than strategies used for steelhead, or at least they should be. 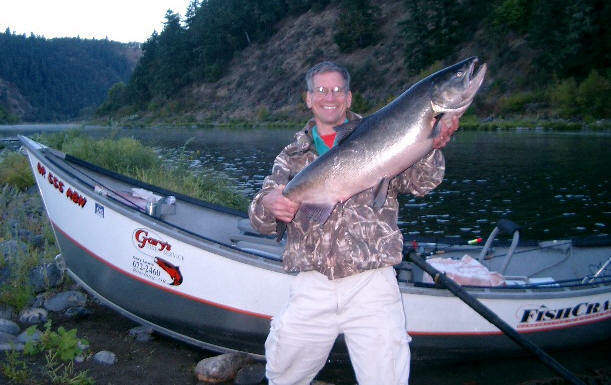 The river banks have changed over the past few years, not that long ago the majority of steelhead anglers would be walking the river banks casting under brush, behind rocks and under logs, a few casts in the pool, hit the tailout and on to the next run. Every cast meant a new opportunity for that trophy. You could cut the air with a knife the angler’s concentration was so focused on the float. Now a days most anglers are bunched up fishing shoulder to shoulder, what I call combat fishing. Call me what you will, but to me this is not what steelheading is about. These strategies are okay for salmon, but steelhead? The steelhead runs on our local rivers are unlike the abundant salmon runs. The numbers of fish are much less. The average year the Vedder River will receive hundreds of thousands of salmon; an average steelhead season is 6 to 10,000, big difference. Steelhead are just big trout, their habits are much the same as those small 8 inch trout you caught as a child in the stream behind your house or down the road in the gully. Those small trout had a lot of predators, eagles, hawks, beavers, muskrats, kids with hooks and worms. Those small trout needed cover or structure to keep predators away, logs, overhanging branches, deep pools or fast riffle tailouts all provided good cover. 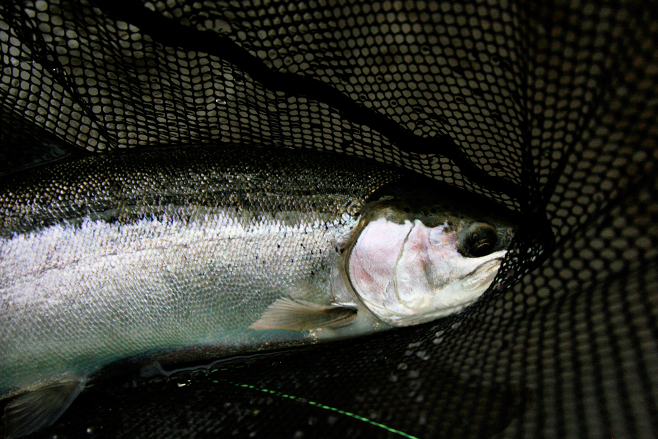 Steelhead are much the same, they need the same protection that those small trout needed. The early runs of steelhead on our local rivers do not enter the river in large schools; instead they trickle in a few at a time. This is why strategiesused for salmon don’t really produce good results for early season steelhead. Steelhead will enter the river is small groups, as they make their way up river, these fish will use various types of water and structure as habitat. The angler needs to focus on the habits and steelhead habitat requirements in order to be successful. Yes, you can stand on one rock all day, cast 1,000 times in the same spot and still catch a fish. This method does work but you’re success will be limited, if lucky, only catching that one or two fish that just happened to cruise by. More often than not, steelhead will find structure in the river that makes them feel safe from predators. Structure is not always an object, deep pools, cut banks, choppy water are all good structure. More obvious structure would be, logs, branches and boulders. Now that we know where steelhead might hide we need to concentrate our fishing in those high percentage areas. Because early fish travel quite quickly up the river, I like to fish the main channel early season, concentrating my efforts in primary and secondary travel lanes and holding water. Head for the top section of the run you choose to fish, begin by fishing what you think is the primary and secondary lies in the run. (This would be the most likely place a fish would travel or hold) Begin fishing the primary and secondary lies or lanes. Only fish the water that you feel is the best steelhead water in that run; leave behind the rest. Don’t continually cast in the same spot. I use a 10-cast rule for larger lies and 5-cast rule for smaller lies. How many times have you heard an angler say, “ my 50th cast in the same spot and WOW! Fish on” Not many I would guess, usually it’s more like the 1st or 2nd cast and WOW! Fish on. This really tells you something, most steelhead attack the lure the first time they see it. Keeping this is mind, fish quickly through each run but be sure to make at least a couple casts in each primary lie and secondary lie. Remember to leave the less productive water alone and continue down the river to the next run. Again, fish only the primary and secondary lies. Once you begin fishing the river is this manner, you will not only cover more water but you will more likely come across anglers on your journey that have either had a fish on or landed one on the beach. There isn’t any better way to gather important river information than from your fellow angler who’s goal happens to be the same as yours, hookin silver bullets. Early season steelheading can be some of the more rewarding fishing you will do all season, even if you don’t hook into fish. Not only are you out fishing, which is always a good thing, but you are also gathering information that will be helpful later on in the season. Each year the rivers change, deep holes get filled in, main channels get turned into side channels, water flow rates change in various areas of the river, large tailouts get washed away, logs and debris get moved around the river channels. Last years hot spot can be totally wiped out so new water must be found. All these factors are critical to mid and late season success. Steelhead are creatures of habit; it’s as if they remember the river and seem to know that they once lived there. They also seem to prefer the same types of holding water and travel lanes throughout the river. If you catch a steelhead behind a specific rock, the chances of catching another one behind the same rock at a later date is very good. Same goes with larger runs and tailouts. If you hook a fish 3 feet from shore in a particular tailout the chances of hooking more steelhead there are very good. This is when your early season tactics begin to pay off. Now its mid season, there’s plenty of fish in the river and because you covered most of the river in the early season, (keeping mental notes on where fish were being hooked), you can now fish the most productive water with the least amount of guess work in primetime. 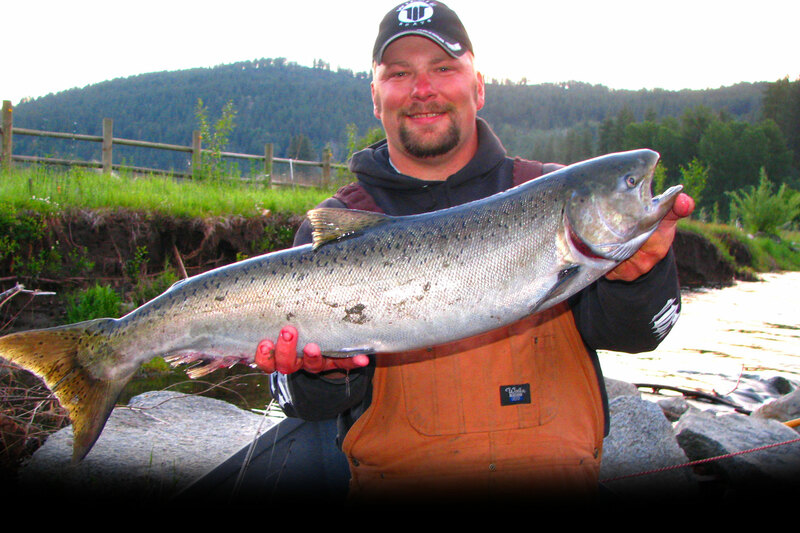 STS Guiding Service is once again offering our annual steelhead/river fishing seminar. This seminar has been very popular over the years with local and visiting anglers from across the border. The seminar consists of 2 nights in a classroom and 1 day on the river with Vic Carrao of STS Guiding Service. You will learn the basics of river fishing plus lots of tips and tricks that have been proven for steelhead. Vic will also show you how to make your own lures and save tones of $$$ on tackle. The seminar will be held in January at Hub Sports in Abbotsford and Gills Tackle in Langley.